I sometimes hear thais say “kaw” (not sure how this is written) instead of ao when ordering at the restaurant. However, you did not mention this in your video. Is it because “kaw” is not a correct word to use? I love your videos. Your pronunciation and the speed at which you speak are excellent. Unfortunately, this is rarely the case in every day life. But “practice makes perfect” as the saying goes. “ขอ kăw” can be used when making order as well. “เอา ao” is just less formal. Both words are interchangeable for placing food order. Love your videos! Well done – instructive and entertaining at the same time. I have a question that’s probably been answered somewhere already but I couldn’t find it. Are these two different words or just a different pronunciation of the same? Thank you for your comment. I am happy to hear that you found our videos useful in your Thai learning. The word คุณ [khun] is put before first names or nicknames when refer to others, or when it is used as second or third person pronouns. It is used to address both males and females of similar or higher status in formal situation. 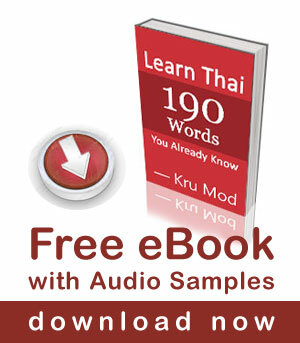 Don’t use คุณ [kun] before your own name when you refer to yourself. As for the second word I assume that you are talking about the word ครู /kruu/. It means ‘teacher’, ‘instructor’. My favorite of your videos. Well done and thank you! Hi. Great video. I am new to your videos but whenever i go to Thailand i always hire a car so a video with filling up with petrol, breaking down or flat tyre with be useful to me. You may have already done this but i have not seen one. ,You make the best Thai language videos i have seen. Thank you for your suggestion. We have not done this yet. That is a good idea! Thank you Mod and Pear for this excellent video. It is very helpful!!! And your prononciation as well explanation are very clear for foreigners to learn. Please keep going on! We also hope to have more time to make lessons regularly. Chan ben kon Singapore, gamlang rian pasar thai. Just want to say a big THANK YOU for all your videos. They are very helpful and both Kru Mod and Kru Pear acts very well.